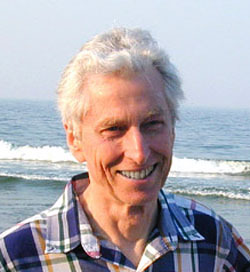 Hildebrand and his students, former students, and other colleagues, study the properties of interstellar magnetic fields and interstellar dust by means of far-infrared photometry and polarimetry. They map the field configurations of collapsing clouds, filamentary clouds, and rotating clouds. They use the angular dispersion of field vectors to determine field strengths, turbulent fractions, and size-distributions of turbulent eddies. By 2012, their observations at the Caltech Submillimeter Observatory, will be supplemented by far infra-red polarimetry with SOFIA, the Stratospheric Observatory for Infrared Astrometry.